Has God cast the Jewish people forever away or does a future glory await them? Vic Batista: Have you noticed that some people are not into reaching out to the Jewish people? They feel that God is through with them and therefore we don't need to bother to evangelize the Jew. But that's not true. We still need to continue to pray for them, for God is not through with them. Nathan Jones: Not at all. Those who believe in Replacement Theology, they believe that the Church has replaced Israel. That's not biblically true according to Isaiah 60:1-62:7 and Romans 9-11 and other passages. We Christians been grafted into the promises and blessings given to Abraham. We've certainly been given salvation and been blessed by the Lord, but that doesn't mean that the Lord hates the Jewish people or wants them destroyed. God didn't send the Jew out into the world to be tortured for 2,000 years. God still has promises that He has made to the Jewish people to fulfill. He promised to regather them back into the land. He promised to bring them to belief in the Messiah. When Jesus returns and sets up His Kingdom for a thousand years, the Jewish people who are saved will be the priestly people of the world. People will come from all over the world to Jerusalem each year and celebrate the feasts I believe at the Millennial Temple (Zechariah 8:22-23). The Jewish people will serve as the priestly people of God. God has promised that. Satan has tried everything he can to destroy the Jewish people. He's persecuted them through the Holocaust. He's persecuted them through Islamic attacks. These attackers will themselves be destroyed, because God has promised that in this passage here in Ezekiel. Vic Batista: That reminds me of what the Bible says in Romans 11:1, "I say has God cast away His people? Certainly not. For I am also a Jew, from the seed of Abraham from the tribe of Benjamin. God has not cast away His people who He foreknew, or do you not know that the Scripture says of Elijah how he pleads with God against Israel." Then Romans goes on to talk about the prophecy. Again and again throughout the Scriptures, God proclaims He is not through with the Jews. He is going to regather them and He is going to do an incredible work through them, and we are seeing the beginnings of that right now. Nathan Jones: If you are into Replacement Theology, you kind of skip Romans 9-11. You never hear a Replacement Theologian preach on Romans 9-11, because they don't want to. The omission is so sad for the Church. Sadly this teaching is growing. It's infected with that same hatred of the Jewish people that the world seems to have. Have you ever seen a people group so despised as the Jewish people? We have groups like Boko Harem in Nigeria slaughtering Christians left and right, but they are not as hated as the Jewish people. Israelis live in a democracy and treat the Arabs that live in their country very well. Israel also provides the world with all sorts of technology. A lot of the technology we're even wearing comes out of Israel. Israel gives back a lot to the world, and yet the world hates them. Such hatred has to be supernatural in origin. That unfathomable hatred shows us that we are living in the end times. That supernatural hatred of the Jews goes beyond reason. It's infected the Church and has caused the growth of Christian Palestinianism in the Church today. It's rather disturbing. Vic Batista: It's interesting that people don't see all the contributions that the nation of Israel has made to the world. Some of the greatest inventions came out of Israel, right? Nathan Jones: Exactly. If you have an iPhone, the Jewish people were involved in its development. A lot more of our technology comes out of Israel. Their scientists have won more awards and prizes than any other people group out there. And yet, the world absolutely hates them. The Lord has blessed the Jewish people with incredible intellects and the ability to handle money. Some Jews have also used their intellect very unwisely. There have been some very dangerous Jewish people in history who have messed up economies and even now are messing up the United States' economy, for the Lord has risen a number of influential Jewish people to such great power. But then, when a Jewish person gets saved, they become like a super saint. They have all that ability and they are amazing in preaching the Gospel. In the Bible we read about 144,000 Jews who will get saved during the Tribulation. They will become God's evangelists going out into the world spreading the Gospel. They are going to be like 144,000 Paul's going out there. Just imagine that kind of ability and power preaching the Gospel! That's what they are going to do. Vic Batista: I love verse 29. God closes there in Ezekiel 39. He says, "'And I will not hide my face from them anymore, for I shall have poured out My Spirit on the House of Israel,' says the Lord God." It reminds me the prophecy in Joel and in Acts where the Holy Spirit was poured out. Nathan Jones: Joel talked about how in the last days the Lord's Spirit will be poured out again on the house of Israel. 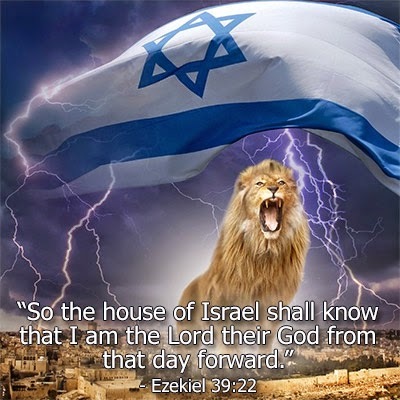 Israel will not be trapped roaming around the world without a country, nor hated and despised by the world, nor will their hearts be against God anymore. They will turn their hearts back to God. The beginning of the Tribulation will be a tremendous time for the Jewish people as they all leave their homes abroad and make their way to Israel. That mass return sets the stage for a bigger scenario and a bigger war during the seven-year Tribulation. Their next challenge will be to live in a world where the Antichrist will try to destroy the Jewish people. The Jewish people's faith in God will really be put to the test, and only a third of the Jews who survive will put their faith in Jesus as their Messiah. Vic Batista: I find it encouraging to see what a wonderful plan God has for the Jewish people and all of humanity. God is not through with Israel, the same way that God is not through with us. Recognize how much God loves you. His Holy Spirit is at work today. He's calling you to come to Him before time runs out. Time is really running out for the world as we know it. Nathan Jones: It is. We are in the last days, for the setting up for these wars is to take place in the last days. We know as we are getting closer that we really need to make sure that our hearts are right with the Lord. We must get serious about giving our lives to Jesus Christ and putting our faith and trust in Him, because the time is short.